NEW YORK (WABC) -- I was interviewed this week by two psychologists - a New Yorker and a researcher from Japan - as a participant in their study about the "psychological experience among survivors of the September 11 terrorist attacks in New York City." When they approached me, I wished them luck with their important project, but said I couldn't participate because I wasn't a survivor of the attack. Oh but you are, they argued. You covered it. You lived through it. Yes, I said, but not like a first responder, or someone who worked in the building and who made it out, or who got to work just before the twin towers were attacked, or someone who lived in the neighborhood, or the surviving family of someone who was murdered in the attacks. We disagree, they said. We are casting a wide net for the concept of "survivor," and you qualify. And of course they're right. The degrees of pain were of course different, but the sad and hard truth is that everyone is a survivor of that fateful Tuesday morning back in 2001. That horrible morning that started off with so much beauty - a classic late summer September drawn with crisp, clean air and a wonderfully blue sky - but ended with, as Bruce Springsteen would later write, my city in ruins. Like all Sept. 11 anniversaries, we will stop and remember, listen to the reading of the names of the victims - by relatives - at Ground Zero, and, if you're like me, we'll cry. For me, it's impossible not to. The pain from that day, the feeling of helplessness, of being attacked by murderous terrorists, of so much bloodshed, of so much sorrow - all that never really goes away. Not for any "survivor" of 9/11. Last year, the country seemed on the brink of war with Syria, with President Obama making his case to bomb Syria in retaliation for killing hundreds of Syrian civilians with Sarin gas. We did not bomb. This year, the rebel group in Syria has now become the uber al-Qaeda terrorists, butchering their fellow citizens in Syria, butchering their fellow Muslims to the south in Iraq. And beheading two American journalists. The world was always a frantic, terrifying place before Sept. 11, 2001. We Americans are just much more aware of it since then. On this 13th anniversary of the butchery, we mourn, still, for all those who were killed. We remember, still, where we were when it happened, what we were doing, what we were thinking, what we were feeling. And how we felt afterwards. I have told this story before in these annual remembrances, so for those who have heard it, forgive and indulge me. I was getting ready to go to the gym on that Tuesday morning back in 2001. It was a bright, crystal-clear blue sky; the first week of school for my kids. Spirits were high. "Looks like a plane crashed into the World Trade Center," he said. "Maybe a small plane. We want you to get in here and anchor this special report." I hopped into the shower and turned the TV volume up all the way so I could hear what was happening. It was clearly unclear what was going on. I remember that the man who was anchoring at the time - a man who no longer works here - said that for two planes to crash into the Twin Towers something had to be wrong with the FAA's radar system. I recall throwing the bar of soap against the shower wall. Hard. And I remember yelling. Loudly. Something obscene at first. And then, "WE ARE UNDER ATTACK!" And then something obscene again. I jumped out of the shower, rushed into work, and was on the anchor desk as the second tower collapsed. Sandra Bookman and I stayed on air for hours. Jim Dolan was also there, monitoring the flood of bulletins, including the one that said a United Airlines flight had disappeared from radar somewhere over rural Pennsylvania. How could it not be connected to the two planes that had crashed into the World Trade Center, and to the plane that, as we had found out, had crashed into the Pentagon? It make sense they were connected of course, but we had no confirmation connecting the Pennsylvania crash. Not yet. That first day is a blur of images and emotions and tears held back. Not a blur that's out of focus - because I remember most of it so clearly. But a blur that's all connected, so much so that it runs together. All those terrible events of that day were, in fact, a string of one larger event. Like each single frame of a film strip. Blurred together, they make a complete picture. The image of those dust clouds erupting as each building collapsed, so final and destructive. The image of people jumping from the buildings, leaping to certain death, the heat just too intense to tolerate. The last phone calls, some of them to us on the air, from people who maybe knew they were going to die. The thoughts of all those who had family in the buildings, watching them burn and fall as the TV showed the horror of it all. It is difficult not to cry, even now. The emotions 10 years later are, I know, right on the surface. It doesn't take much to bring them up; writing these words is enough to do that. It just all felt so wrong, so terribly misguided and horrific. Whatever gripes and complaints the group that did this had against the U.S., whatever valid criticisms they could level against this country - nothing, NOTHING could ever justify the human carnage they caused and the grief that followed. The grief affected us as well. Don DiFranco, a member of the Eyewitness News team, was on the top of one of the towers when it was attacked. Don was an engineer - and his first thought after the plane crashed into the building 20 floors below him was to call us and tell us we might be off the air because of the crash. That was what he worried about. I hope only that Don didn't suffer. There are two other images that haunt me that involve our staffers. The first is Nina Pineda and Lauren Glassberg, huddled and hugging behind a car, as the dust swirls around them. The fear - seared on their faces and in my memory. The other is a "stand up" on tape by NJ Burkett. A burning tower was over his shoulder as he looked into the camera and talked about what was happening at that moment in Lower Manhattan. His cameraman suggested he do it again - another take. He did...and as he spoke, the ground rumbled and there, over his shoulder, the first tower crumbled. NJ looked back, and then, like everyone else around him, started to run. It is easy to talk about closure - but I simply do not believe there is such a thing. As I said earlier, the wound can scar over, but there is no closure for a wife who no longer has her husband, or for parents whose child was killed, or for a child whose mother perished that day. The people who died that day aren't lost. They were killed. And to say "lost" is, I think, to sugarcoat the reality. It's harsh what happened, and we should acknowledge the harshness. They were killed. They died. They weren't lost. We know what happened to them. 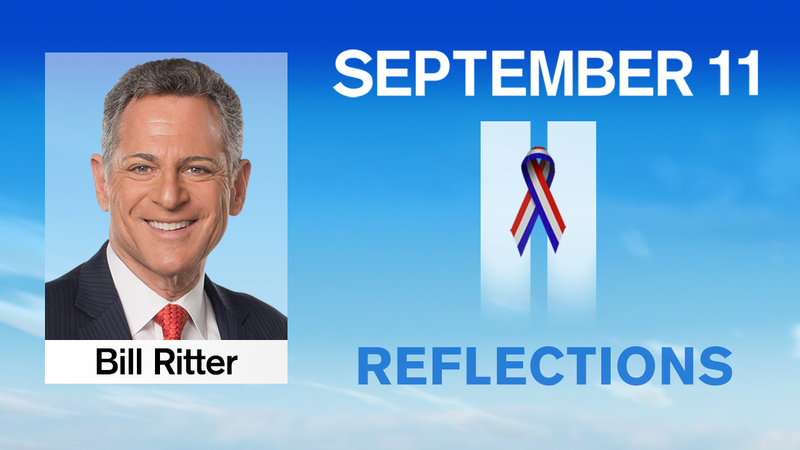 And so as we've done on Sept. 11 every year since the attacks, we will remember again this year. I was there for the catastrophe. And I've been there for the memorials. And I will be there for the 13th anniversary. It's my honor and privilege to participate. For those of you who will watch our coverage of the ceremony at Ground Zero, know that we will be feeling the same emotions as you are. For all of us, a moment of reflection helps honor those who woke up that day, kissed their families goodbye, went to work, and never returned.